5/CASE. ORDER FULL CASES FOR DISCOUNTS. DESCRIPTION: Effectively seals pipe penetrations on shingle roofs. A high-grade high-temperature Red Silicone rubber collar is molded into a nail-able aluminum base for integration into the shingle roofing system. High Temperature Extreme Duty Red SILICONE seal is ASTM C20 UV resistant and allows a 20 year service life. Fire retarded. Suitable for Class B vents. Listed with IAPMO. Certification # 3121. Lead-free base uses heavy soft gauge aluminum. Built-in 20 degree pitch allow adaptability to roof pitch / slopes up to 45 degrees (12/12). Clearly market pipe diameters on the flashing takes the guess-work out of sizing. Easy Pull-tab design allows smooth and quick sizing. Solar Multi-Port Flashing, Alum. Base: Fits 0 to 1-15/16" pipes. 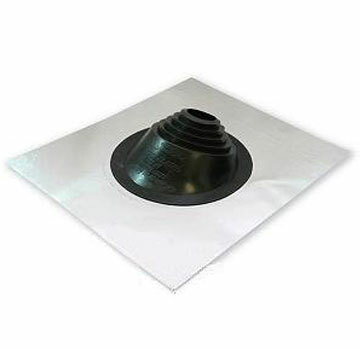 Solar Multi-Port Flashing, LEAD Base: Fits 0 to 1-15/16" pipes.